Investment in Scottish commercial property in the first quarter of 2018 reached £608 million, significantly ahead of the five-year average of £546 million, according to research by real estate services and investment firm CBRE. “The quarter was led by a smaller number of high value deals with the total achieved across 28 transactions, compared with the five-year average of 44 deals,” said CBRE. “This strong quarter performance was dominated by deals which fell over from 2017,” said Alistair Wright, associate director at CBRE Scotland. 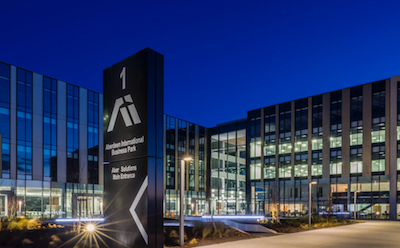 “Notable transactions include the acquisition of the Aker Campus in Aberdeen (£112.5 million), the Waldorf Astoria in Edinburgh (£85 million) and Westway Park in Renfrew (£40 million). “Interestingly, retail investment volumes are relatively low with £41 million (across seven deals) traded in Q1 – in comparison the same quarters in the last three years saw an average of over £135 million traded. “Sentiment remains strong for prime products. “There is a healthy cocktail of investor appetite from across UK institutions and international capital. CBRE said the Edinburgh office market had 139,969 sq ft of take-up in the first quarter of 2018, a 29% decrease from Q1 2017. Allan Matthews, a director in the Advisory & Transaction Services team at CBRE, said: “While the Q1 take-up figure represents a significant year on year decrease, it should be noted that there was no ‘hangover’ of big deals from Q4 2017, with all major lettings completing prior to year-end, contributing to a record take-up for 2017 as a whole. “With a number of substantial active requirements currently progressing, we anticipate take up increasing significantly in the coming months. Edinburgh city centre supply has fallen to 1,072,860 sq ft, less than half the supply figure of Q1 2013, which stood at 2,780,000 sq ft.
Stewart Taylor, senior director in CBRE’s Advisory & Transaction Services team, said: “Based on the five year average, the city has less than one year of Grade A supply. “Add in the three speculative schemes under construction and that rises to a little over one year – but a significant percentage of that space is rumoured to be under offer. “In the past you could point at a range of locations which either had planning consent or could get it within a reasonable time scale.